Little do you know that someday most of your dreams will come true. Your dreams at this age are quite simple, really. Grow up, fall in love, get married, have kids - that sums it up. When you get a little bit older you will be afraid to admit that these things are really all you want in life. People might think you have no ambition! Sure, you'd like to be a veterinarian... or an occupational therapist... or (gasp) a school teacher. But ultimately, you wanted the glamorous life of being a housewife with a houseful of kids. At this point your mind hasn't been warped by Sixteen Candles and the thought that Jake Ryan might be pining for you. (And why wouldn't he, huh?) Your knight in shining armor will arrive in a more subtle way. He will sneak up on you by way of friendship first. And you'll be glad. Already you are running away from boys instead of to them. Relax and know you will eventually find one who makes you want to stay. Sometimes you will need to remind yourself of how blessed you really are. This is the life you wanted. This is the life God has blessed you with. Sometimes you will wonder why you wanted to be a professional maid. Your job will become tedious and you will be tired of cleaning up after every single living thing in your house. It is unfortunate that rodents and birds do not swoop in and clean your house while you sing your good morning songs. Cinderella and Snow White tricked you. You think your family would happily devour every meal you cook for them. And why wouldn't they? You will have amazing recipes and foods that you crave - but you will never make these since you are the only one who will eat them. You will become a short order chef and wonder why you bothered learning to cook. You will never be able to compete with the high quality McDonald's has to offer. You can't wait to join your kids' school PTA and be the President. With one glance, you will quickly change your mind and volunteer in their teachers' classrooms instead. In fact, you will find many other things to be passionate about to volunteer your time with. And you will volunteer with gusto! The list goes on and on as you live the dream. Your mom forgot to tell you that working for free can sometimes leave you feeling a bit drained and under-appreciated. 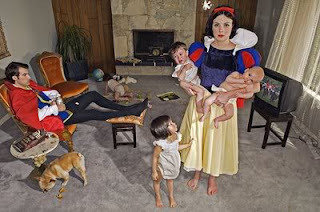 What Happened to Snow White? You will have moments when you wonder why in the world you ever wanted to be a housewife. When you feel this way, just look at the faces around you and it won't take you long to smile. It may not be exactly the way you picture it, but this is your very own real life fairy tale. Your dreams really will come true. who thinks it's time the kids learn to clean their own toilets.